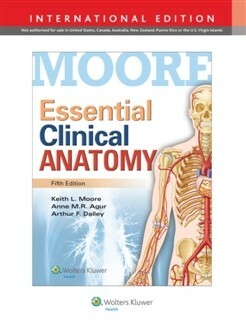 Essential Clinical Anatomy Keith L. Moore, Anne M.R Agur, Arthur F Dalley, Godina izdanja 2014, iZDAVAC LWW Lippinccot Williams and Wilkins,ISBN 9781469832012, ucbenik iz anatomije za Studente Medicine smer na Engleskom. Greys Anatomy International Edition 2015 Knjige Stud. na Englesk.